HAPPY TRAIL: The Madonna Inn bicycle path, set to open to the public in winter 2011, will run along the Madonna Inn property and connect downtown San Luis Obispo to the Madonna Road shopping center and Laguna Middle School. SLO bicyclists, rejoice! A new path will soon be open for your pedaling pleasure, and city officials are hoping the route will cut down on vehicle and pedestrian traffic—as well as vehicle emissions—in town. 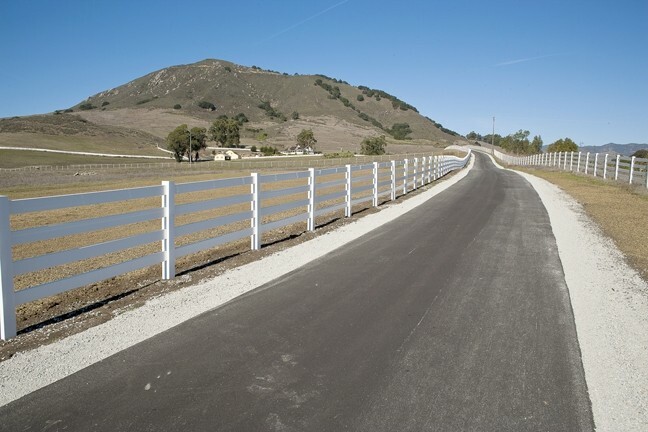 The Madonna Inn Bike Path will provide car-free access from the downtown area of San Luis Obispo via the Marsh Street/Highway 101 underpass, along the Madonna Inn property to the Madonna Road and Laguna Middle School. The path is set to open on Jan. 1, 2011—if everything goes according to plan. According to Public Works Inspector Ron Faria, the path is almost complete, save for a few finishing touches, including installing a pedestrian signal at the crosswalk toward the entrance to Madonna Road and the removal of a eucalyptus tree to straighten the path’s alignment. That issue will go before the city’s Tree Committee next week, and if approved requires a 10-day period for public protest. Other than that, Faria told New Times, a few spots need asphalting and the last of the fencing. Then the path will be good to go. “As long as Mother Nature cooperates, the first of the year is a very good target,” Faria said. The path will be a Class I bike path, meaning it’s separated from vehicle traffic and striped to allow for two-way bike traffic along the trail. City officials are excited that the trail could help with the Air Pollution Control District’s air quality goals, as well as a number of city general plan and circulation policies, by promoting alternative forms of transportation, connecting neighborhoods, and creating a safe pathway for both bicyclists and pedestrians. The path was made possible by cooperation between the Air Pollution Control District and Madonna Enterprises, which is fulfilling an air quality mitigation measure originally outlined in the final environmental impact report for the Irish Hills Plaza to reduce vehicle emissions. Bicyclists who regularly commute between the Laguna Lake area and downtown are eagerly awaiting the path’s official opening.